Automatic Bonus Progression is enough to justify the entire price of the book. Better versions of the Rogue and Monk, as well as fixes to the summoner and streamlining the barabarian seal the deal. There is a lot of other good stuff in here as well. Well worth it! I love the idea of this book, I wish this happened more often. They took what they saw wrong with their game and spent proper time and effort to come up with proper solutions. It's pretty rare for a company to spend this much effort on tweaking things. The new proposed mechanics for combat and skills are unique and great ideas to help customize your groups' gaming experience. I hope they release more books like this in the future. I've love for more variations for multiclassing, and I'm still waiting for a summoner archetype that removes the class summon monster ability and focuses more on the eidolon. Highly recommend it, especially for anyone interested in how someone goes about making a gaming system. It provides awesome insights. It's been a while since it took me so long to digest a Pathfinder book, and boy, did Unchained ever keep me digesting. More optional rules than you can shake a stick at, to be implemented in modular or wholesale fashion, to tweak your game to your heart's content, and with top-notch art throughout, to boot. Excellent work by Paizo and one of their finest offerings in a while. As for the negatives, the only thing I can really point out is that the writing can be somewhat scattershot and unfocused in a couple of reasonably complex sections, which would have benefited greatly from examples or bolded formulae. This book is a great addition. Options are optional, and it's great that this book has so many. It really makes customizing a campaign easy. Of you'll like you never use every option, or likely even half of them in a single you play or run, but having them really gives you a great toolbox to use. Some people are finicky about house rules, so having an official batch of "house rules" to choose from is nice for people who prefer to stick to official products. No book is perfect, but being this book isn't really being forced on anyone (of course I suppose none of the supplements are), and that is a giant bag of options that you can pick and choose from to enhance the game, for those who'd like it enhanced, I give this product 5 stars, especially if I am comparing it to the usefulness of the average Pathfinder product. I'm a huge fan of the rules options in Pathfinder Unchained. They do a great job of creating fixes to some of the potential issues with the Pathfinder system without upsetting the entire rule system. I'm one of those weird people who loved playing my TWF core rogue through all 11 levels of PFS, but I have to admit that the unchained rogue is an improvement. I also actually prefer the unchained summoner to the base summoner; even though the new one may seem less powerful, it's more thematically appropriate. I'm considering playing a summoner for the first time. I've been using some of the alternate rules systems in my Hell's Rebels campaign, and I like how they are working out. I'm using automatic bonus progression at least in part because I know some of my players like to ignore the Big 6, or spend all their gold on +6 stat items as soon as possible to the exclusion of other items. This way I know their AC is still going up, and they'll end up more balanced. I can now also let them craft---using the much more engaging dynamic item creation rules---without worrying too much about wealth by level. Some of the rules I wouldn't personally implement. I feel like alignment affirmations will just lead to alignment arguments at the table, and in my experience, multiclassers don't need the boost from partial base attack bonus increases. But I am glad that these options exist for tables that want them. I know it's only a mock up image, but the cover is awesome! THIS IS WHAT I HAVE BEEN WANTING!!! August? Wasn't it supposed to be a Spring release? If they also give the fighter (and the bard) some love I agree. I want this book so badly. I hope they make the use of skills more Epic at higher levels. 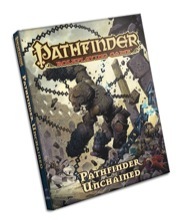 This should totally be called Pathfinder Unearthed. I wonder if this is a Pathfinder 1.5? Okay. Add this to the list of awesome books I want. Curious at to why those iconics are depicted given the content describes new versions of the barbarian, summoner, rogue and monk… Oh. Perhaps it is a mockup. Ooops. Would like to know which authors are contributing as well. Was at the banquet when they announced this, got the impression that this is going to be kind of like a "Pathfinder Essentials"; JB indicated that they were going to make the Barbarian easier to run at the table, present a nerfed and better balanced version of the Summoner, a full BAB monk, and hinted at "improving" the Rogue. Should be interesting. I really hope they don't plan on making a Pathfinder 4th ed version kind of a book. Cool. What news had they on the Shaman and the Skald? This product is off the chain. Hmmm... interesting. So this is the PF version of UA? Wait, what? Why would you need a simpler version of th barbarian? I never thought it was overly complicated. Is this going to have any kind of public Playtest? I hope there will be a playtest. Curse you, Paizo! Curses, I say! So many things coming out this summer and so little money!!! So is this like Book of Nine Swords was for 3.5? A preview into the Next edition of PF? Because "Alternative Action Economy" hints at that for me. I will say that I'm very interested in this "Magic item generator" system. "Unchained" has a very specific meaning for this title. The rules presented in Pathfinder Unchained are not "chained" to the assumption of backwards-compatibility. This is assuredly not a preview of or prelude to any future edition of Pathfinder RPG. Rather, it's a chance to be able to make "changes" that fans have been asking for over the years (and ones the developers have wanted to make over the years) without fundamentally changing the core rulebook and forcing everyone to play under the new rules. It's options, ideas, alternates, and something you can piecemeal insert into your ongoing games. As with all Paizo releases, I'll reserve judgement after I have it in my hands. I am quite interested to see what they do though. Well, that won't stop people, in particular the ones with a long-standing axe to grind with Paizo, to run around the Internet screaming "paid beta of PF 2.0 out next year - WotC did that to you with Bo9s and now Paizo is doing it again". I wish Book of Nine Swords had been a paid beta, it was not similar to 4E. You can argue its maneuver system was put into 4E, but only if you squint and really work it backwards. It if anything felt more like 3.5 trying to do wuxia or something similar. +1. If 4E had been based on Bo9S I probably would have been a lot more interested in it. Heck, it probably won't even stop people *without* grudges from continuing the "Pathfinder 2.0 is coming!!" chant like they've already been doing for some time now. Ok, so this is closer to a book of errata and rules amendments. It just so happens to have some redesigns on a number of "problematic" classes. Summoner, I can understand. It tends to require a different kind of system mastery than most casters, and is even more accounting heavy due to the malleable eidolon. Rogue makes sense too. A number of traits, alternate class archetypes, and other sundry things make the rogue seem totally lackluster to practically everything. Monk is a little hazy on the revamp, though I understand that full BAB reduces language for Flurry of Blows. May also make it easier to qualify for various maneuver feats, which tend to be the Monk's niche. But the Barbarian is the real oddity. I get that rage cycling is a problem, and that some rage power combos are a GM's nightmare. But I honestly can't think of much else they'd consider revamping. I wonder if this is Paizo's attempt to make a more rules light version, kind of like Dungeon World (but obviously not quite that light)? I just recently read through the basic rules for DnD Next, and it seems like they decided to go in a more rules light direction. Seems to be all the rage these days. I love me some pathfinder and complex systems, but it's so much easier to get my friends and family to come back to the table with a game like Dungeon World, so I'm all for this. I hope they keep the malleability of the eidolon. Its a really cool mechanic in my opinion. I would hope Brock and co. carefully evaluate the new rules and import the best of the book while omitting the rest from PFS play. At a minimum, I would like to see the monk and rogue updates make it into the allowed resources. The summoner we currently have is the first iteration of brand new class concept. It was bound to have many unforeseen issues. Unchained will give the developers the opportunity to correct many of those issues provide a more refined set of abilities. Hopefully they don't nerf the class into the ground. On the subject of summoners: I would like to see the synthesist revamped and given far more attention than it received in Ultimate Magic. The archetype is a very popular concept, but poorly implemented under current rules. What is bad is the option to dump nearly ALL evolution points into offense, creating an unbalanced eidolon. I'm actually more interested in this than in the ACG. I do wonder why you are so sure of that, and why it cannot be both. Uhm, I'd be delighted if it were that. Either way, I'll definitely be picking it up.